How much oil gushed out of the Deepwater Horizon well and into the Gulf of Mexico? For all stakeholders in the oil spill, that is a critical starting point for any discussions of fair settlements. For scientists, it is the key measurement to begin accounting for where the oil went, what happened to it, and what impacts it may have. To get that measurement, scientists faced a huge challenge. They not only had to find out how fast the material flowed out of the well. They also had to determine precisely what proportion of the billowy mixture was liquid oil, and how much was natural gases such as methane. “The gas-to-oil ratio is crucial to an accurate determination of the amount of oil that was released,” said Chris Reddy, a marine chemist at Woods Hole Oceanographic Institution (WHOI). But getting a definitive, unadulterated sample from a well spewing more than a mile beneath the sea surface is no simple matter. Researchers couldn’t just lower a bucket down, or any devices routinely used to sample seawater. Oil and gas gushing out of the broken well was hot. The oily black mixture would have been boiling had it not been under the extreme pressure at 1,500 meters deep, about 2,200 pounds per square inch. Any sample had to be taken before it mixed with cold seawater immediately after it emerged from the well. The empty sampling device also had to withstand the intense pressure at depth. And once it was filled, it had to withstand the pressure from the compressed gases inside, so that none of the gases would escape. WHOI chemist Jeff Seewald had the perfect tool for the job—although he didn’t invent it for collecting deep-sea oil. About 10 years ago, he and WHOI engineers Kenneth Doherty, Terence Hammar, and Stephen Liberatore began developing the Isobaric Gas-Tight sampler, now commonly known as the “Seewald sampler.” They built it to collect samples of hot fluids and gases released in a similar high-pressure, deep-sea environment: hydrothermal vents on the seafloor. At about 18 inches long, 7 inches wide, and 33 pounds, the ultra-strong titanium Seewald sampler is a bit larger and a lot heavier than a 2-liter bottle of soda pop. At one end is a slim snorkel that’s roughly the same size and shape as a drinking straw with a bend in it. That’s the probe that is placed in the flow to sip fluid into a pressurized chamber. A key feature of the sampler is that scientists can control the rate at which fluid will enter the chamber. If the sample chamber were allowed to fill instantly, it could fill with seawater rather than collect the fluid of interest, or misrepresent the amount of gas and liquid oil in the fluid. “There’s a potential that you may have the snorkel located in a bubble of gas or a bubble of liquid, and that would not get you a representative sample of the complete fluid that’s being released at the seafloor,” said Seewald. The sampler’s design allows researchers to draw in fluid slowly enough to obtain a more representative sample. The sampler also maintains the sample at the high pressure at which it was drawn. “Most of the work I have done on hydrothermal vents would not be possible without the use of these samplers,” said Seewald. They have enabled him to measure the confluence of chemicals spewing from vents, a different recipe at each site. The chemical compounds provide nourishment to thriving communities of organisms at the vents and clues about the origin of life on Earth. The fluids are also end products of chemical reactions deep within the Earth, and thus offer scientists evidence of underlying volcanic processes that form mineral deposits and shape the seafloor. Seewald recently used his sampler to collect hydrothermal fluids with a pH of 0.9—more acidic than battery acid, and to his knowledge, the most acidic vent fluid ever collected. It has also been used to sample naturally occurring cold seeps, where lower-temperature hydrocarbons leak out from the seafloor. But Deepwater Horizon was a whole new stage for it to perform on. Within a few weeks, a Seewald sampler was on its way to the Gulf, along with Reddy, fellow WHOI scientist Rich Camilli, and research associate Sean Sylva. The U.S. Coast Guard arranged for the scientists to collect and analyze samples independently of any parties that have an interest in the outcome. 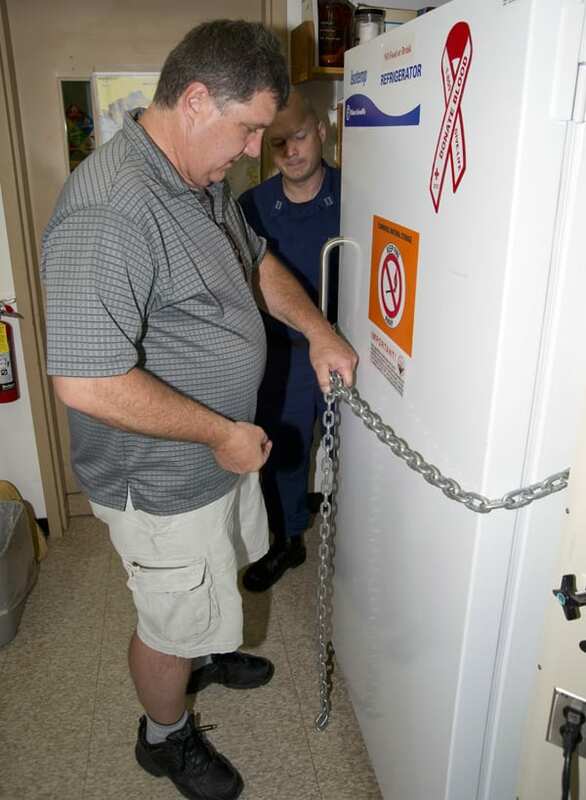 Every stage of the process—sample collection, transport, and analysis—was done under the watchful eyes of the Coast Guard to ensure the integrity of the sample. The first challenge for the researchers was to get the sampler to the well. 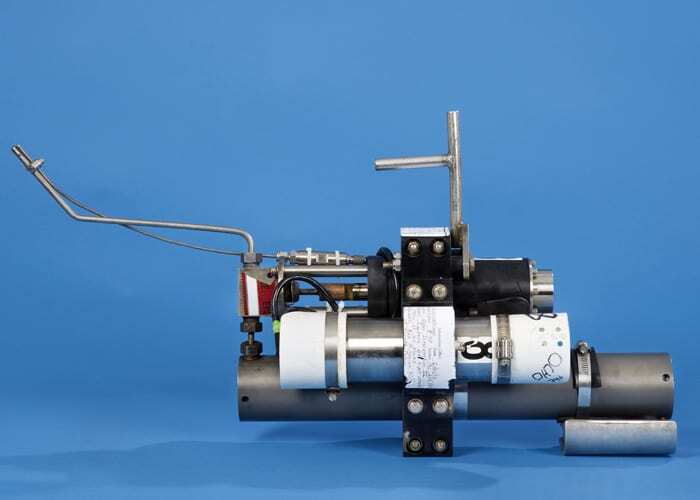 Normally the sampler works from a WHOI deep-diving vehicle, such as the submersible Alvin, or Jason, a remotely operated vehicle (ROV). Both can be outfitted with holsters that serve as ports for the sipper before and after it takes its sample. 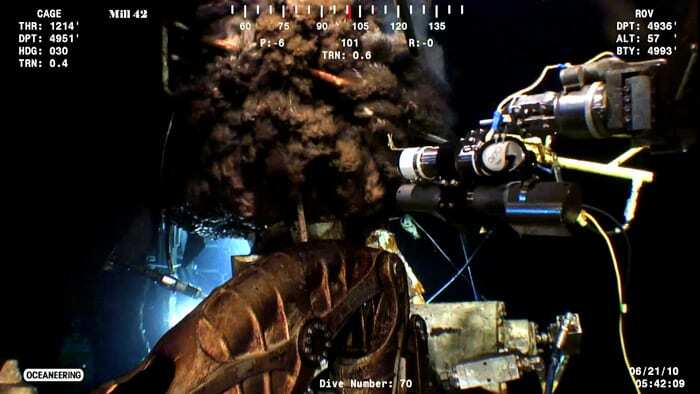 At the Deepwater Horizon site, the sampler was wielded by the manipulator arm of a commercial ROV, operated by the oilfield engineering firm Oceaneering. That ROV did not have a port to hold it on its way to and from the well. 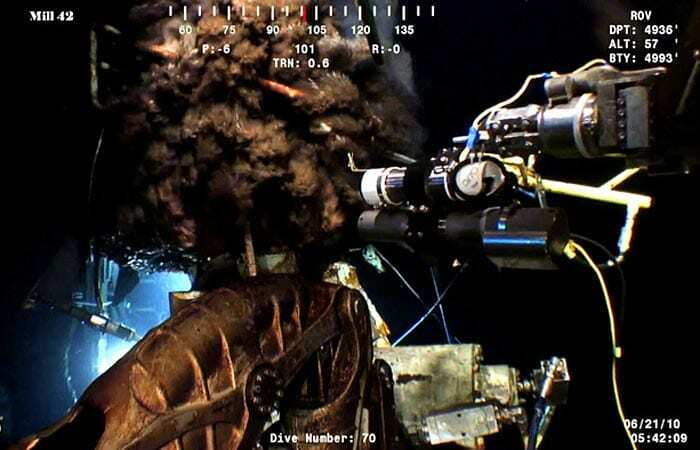 At the well, the ROV operator manipulated the mechanical arm by remote control from a ship at the surface. He had the arm pick up the sampler and maneuver it so the snorkel poked into the dark clouds of oil and gas belching from the pipe. A thermometer on the tip of the snorkel told Sylva, Reddy, and Camilli when the sipper was in the right spot to draw the sample. At peak temperature, Sylva hit the button that opened the sampler’s intake valve. Waiting until the snorkel was in the hottest area guaranteed a high-quality sample. If the valve had been opened in cooler surroundings just a few centimeters away, it would have collected mostly seawater. The sampler sipped slowly, taking about 90 seconds to collect 150 milliliters (just over 5 fluid ounces) from the mouth of the well. Seewald said material was flowing out of the well much faster than that, but taking it in slowly let them get a good mix of oil and gas. “Had the sampler filled instantly, we could have preferentially sampled either the liquid oil or the gaseous methane,” he said. Using a second sampler, the team took another sample at a different part of the well. With the samples secured in their pressurized chambers, the samplers were brought aboard ship. 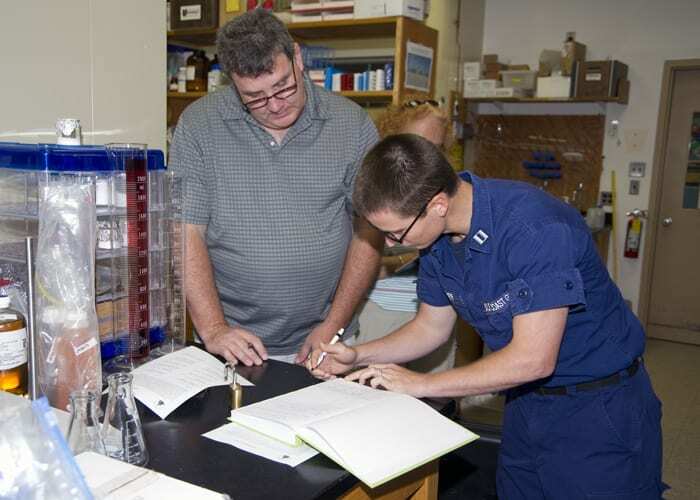 Lt. Jarrett Parker of the U.S. Coast Guard took a workboat back to the mainland, beginning the sample’s carefully guarded journey to Woods Hole, where Parker and Lt. Joseph Kusek transferred responsibility for the chain of custody to WHOI research specialist Bob Nelson. The scientists anticipate a flurry of attention about the sampler from colleagues and the media once the results of their analyses are published in peer-reviewed journals. 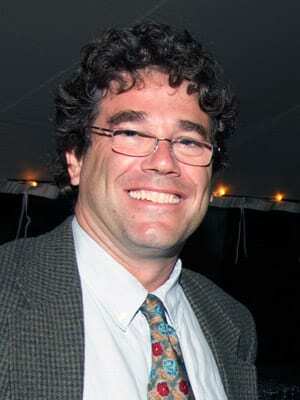 After a decade of pioneering work on hydrothermal vents, the Seewald sampler may be about to enter the spotlight. This research was funded by the U.S. Coast Guard and a National Science Foundation Rapid Response grant. 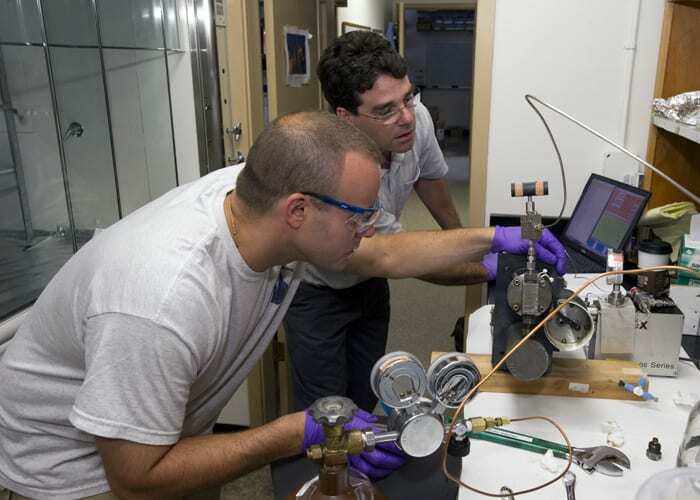 Development of the Isobaric Gas-Tight sampler was supported by the NSF and a Green Technology Award from WHOI. After receiving the Isobaric Gas-Tight samplers containing samples of material from the broken wellhead, WHOI's Bob Nelson stored them in a locked refrigerator until they could be tapped to extract the oil and gas in them. Coast Guard Lt. Joseph Kusek observes.